DATE: June 20th, we will leave in the morning, stay at the campsite for 2 nights and come back Sunday morning of the 22nd. 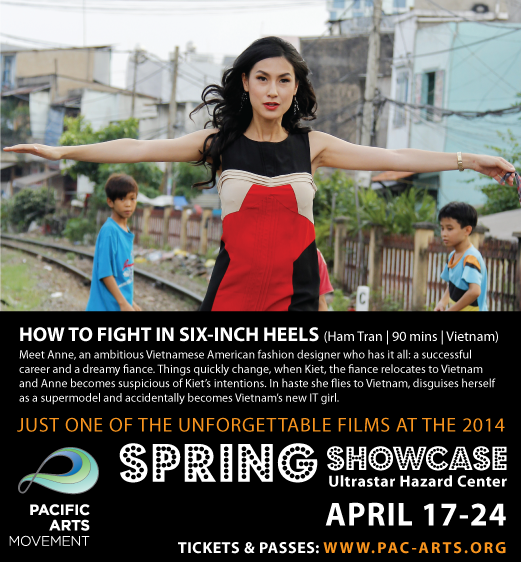 VAYA is a sponsor for Pacific Arts Movement‘s spring showcase movie, “How to Fight in Six-Inch Heels” by Ham Tran. In the new uproarious comedy, HOW TO FIGHT IN SIX INCH HEELS, director Ham Tran (JOURNEY FROM THE FALL) and triple threat – writer/producer/star – Kathy Uyen (KIEU) team up to create a vibrant Asian American feature that scored box office success in Vietnam in 2013. Meet Anne, an ambitious Vietnamese American fashion designer who has it all: a successful career and a dreamy fiance. Things quickly change, when Kiet, the fiance relocates to Vietnam and Anne becomes suspicious of Kiet’s intentions. In haste she flies to Vietnam, disguises herself as a supermodel and accidentally becomes Vietnam’s new IT girl. HOW TO FIGHT is a benchmark film that showcases the best of Vietnam’s film industry, which is lead by a plethora of Asian Americans. Reminiscent of THE DEVIL WEARS PRADA, HOW TO FIGHT is a cleverly written film bursting with strong female characters, a perfect blend of humorous and touching moments and of course, fashion a plenty. 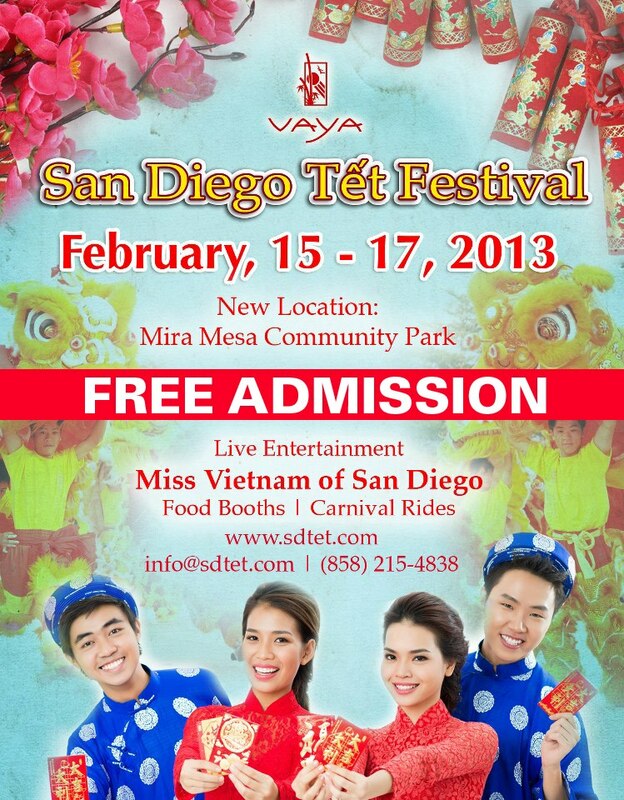 Mira Mesa – The eighth annual San Diego Tet Festival, the Vietnamese New Year celebration, will be moving to from its usual home in Balboa Park to Mira Mesa. Because of the preparation for the 2015 Centennial Celebration, the festival’s usual spot at the corner of President’s Way and Park Boulevard is under construction and will not be available. 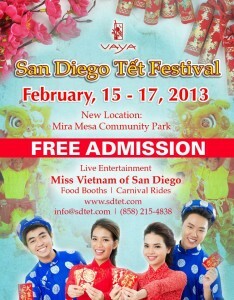 This year’s festival will be held at Mira Mesa Community Park, 8575 New Salem St.
Want to join in the planning for Tet 2013? Here’s your chance. San Diego County’s largest Tet Festival is looking for a few good men and women to plan the 2013 Tet Festival, your Tet Festival. All positions are available. You can check what’s available by downloading the VAYA-TET-POSITION-APPLICATION-2013. Got more questions? email us at eboard@vayasd.org. Let’s make 2013 the best one yet. SAN DIEGO — The Vietnamese-American Youth Alliance announces the theme for its annual Tết Festival, which will be held on Jan. 20-22 in Balboa Park, will be Con Rồng Cháu Tiên, roughly translated to “Children of Dragons, Descendants of Gods,” to welcome the Year of the Dragon. The theme is rooted in a Vietnamese origin myth. Lạc Long Quân (The Dragon Lord of Lạc, an ancient Viet tribe), is considered to be the Father of the Vietnamese people. His wife, Âu Cơ, a mountain goddess, is considered to be the Mother of the Vietnamese people. After a few years of marriage, Âu Cơ, the granddaughter of Shen Nong (Thần Nông in Vietnamese), the God of Agriculture, gave birth 100 sons. Lạc Long Quân, son of Thần Long Nữ (Lady Dragon Spirit), yearning for the seas, took 50 sons with him towards the sea, while Âu Cơ, longing for her mountain realms, took 50 sons with her to the mountains. The eldest son, who followed his father, later established himself as the first monarch, Hùng Vương, of a nation that is now known as Vietnam. This is why Vietnamese today refer to themselves as the children of dragons and descendants of gods. The festival, which attracts 20,000 people each year, promises fun for whole the family with such activities as carnival rides and games, authentic Vietnamese food, lion dancing and firecrackers. And entertainment programs, such as the Miss Vietnam of San Diego, Mr. Vietnam of San Diego pageants, Kids Spotlights and San Diego Tết’s Got Talent. There’s also a Cultural Village to immerse yourself in Vietnamese culture. Festival Dates and Hours are: Friday, Jan. 20, 2012 from 5 p.m. to 10 p.m.; Saturday, Jan. 21, 2012 from 11 a.m. to 10 p.m.; Sunday Jan. 22, 2012 from 11 a.m. to 5 p.m.
Vietnamese-American Youth Alliance (V.A.Y.A), a 501(c)3 non-profit, non-partisan, community-based organization, was founded in 2004 as a means for Vietnamese-American youth to organize socially and culturally within the local communities.